Needle Io Jeswa & Otto Von Schirach’s take on the score for NOSFERATU; crazy electronica piece that will punch you right in your third eye. 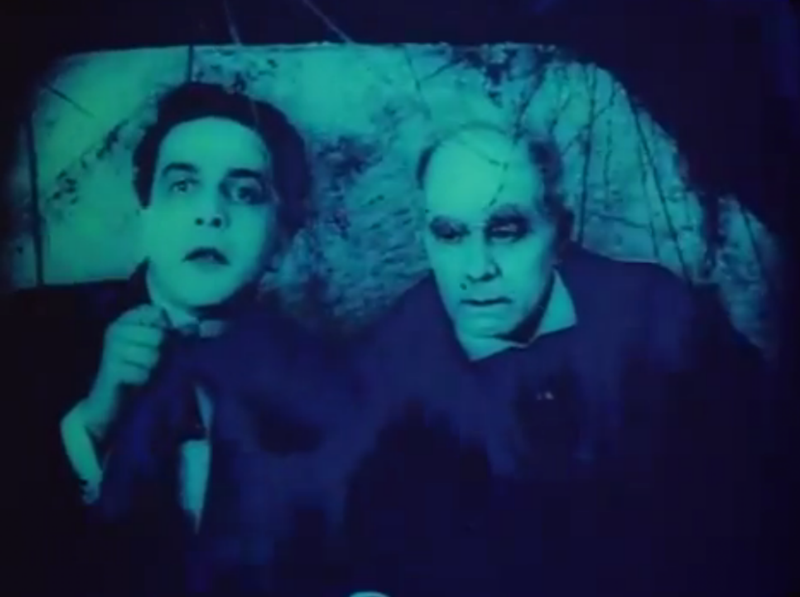 THE CABINET OF DR. CALIGARI (1920) – The Dungeon Review! According to Wikipedia Expressionism is: A modernist movement, initially in poetry and painting, originating in Germany at the beginning of the 20th century. Its typical trait is to present the world solely from a subjective perspective, distorting it radically for emotional effect in order to evoke moods or ideas. Expressionist artists sought to express meaning or emotional experience rather than physical reality. Expressionism was developed as an avant-garde style before the First World War. 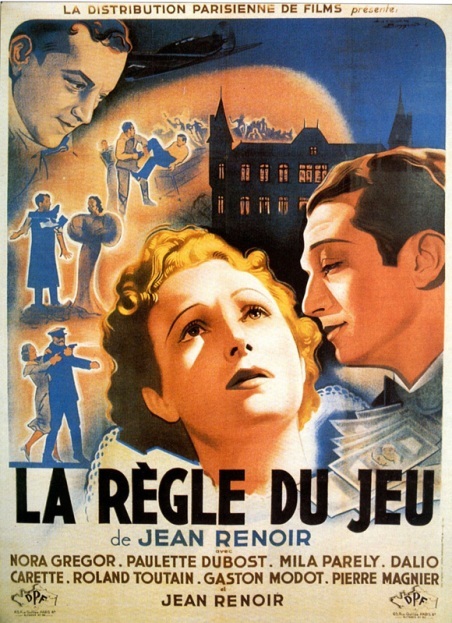 It remained popular during the Weimar Republic, particularly in Berlin. The style extended to a wide range of the arts, including expressionist architecture, painting, literature, theatre, dance, film and music. According to Guggenheim Museum (online) Expressionism is: Primarily Germany, and Austria, first decade of 20th century. The very elastic concept of Expressionism refers to art that emphasizes the extreme expressive properties of pictorial form in order to explore subjective emotions and inner psychological truths. According to Goregirl Expressionism is: A mostly German thing as far as I know. 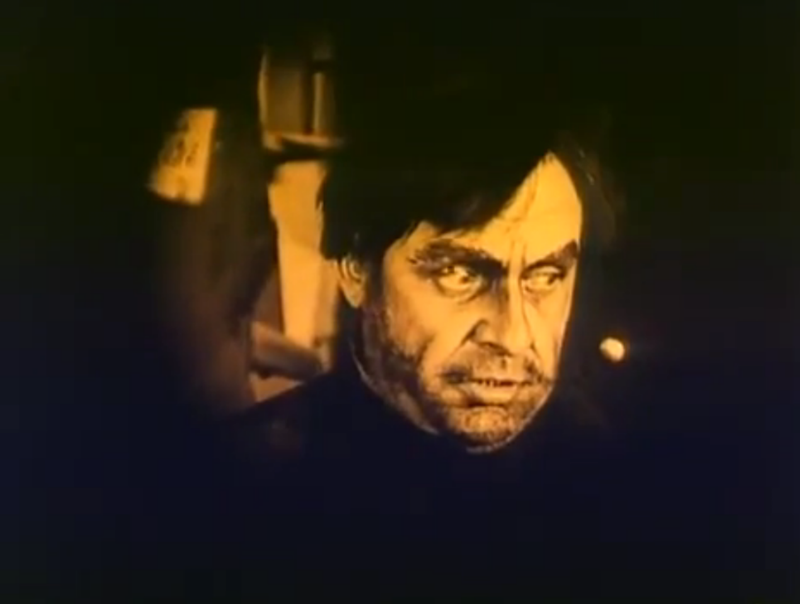 Used in some very freaking cool German silent movies the bestest and shiningest example of which is Robert Wiene’s The Cabinet of Dr. Caligari. The sets all look artificial and everything is severely angled and exaggerated in size. Every single gorgeous hand-painted set is extremely elaborate and immensely impressive. 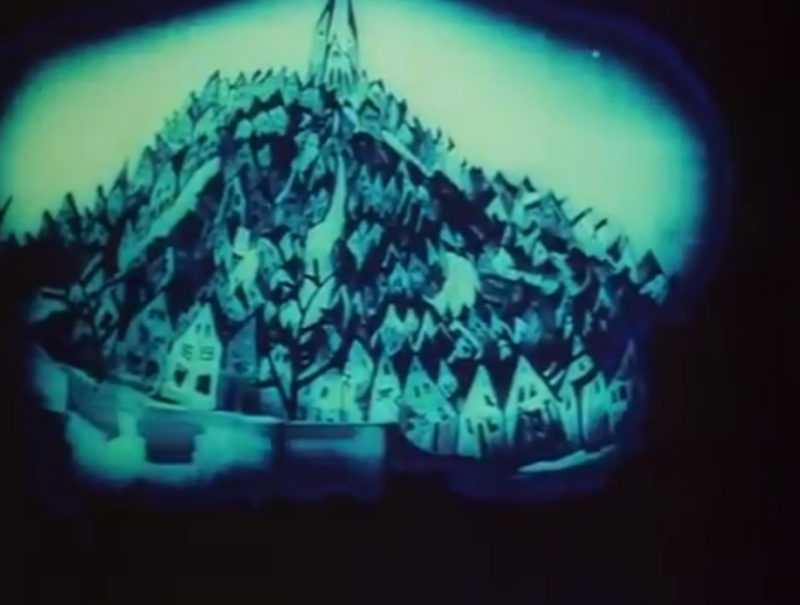 I dreamt of walking through a Dr. Caligari forest to a Dr. Caligari carnival every night for the past several nights. 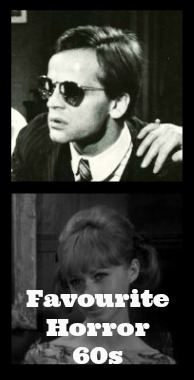 I’ve dreamt of being chased by letters of the alphabet and being kidnapped by a handsome somnambulist who wears a lot of eyeliner. 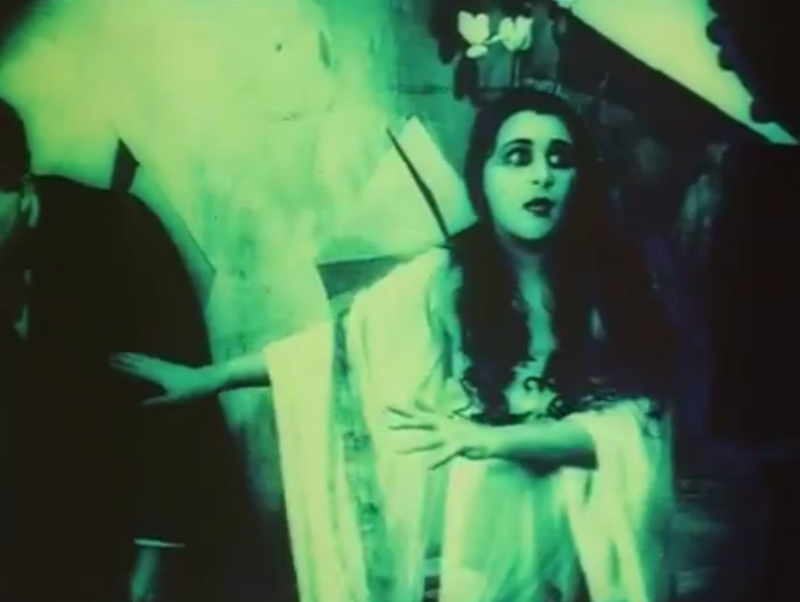 I can not expressionism myself more clearly when I tell you anyone who loves and appreciates art and all things wonderful, strange and unique must absolutely positively visit Robert Wiene’s amazing The Cabinet of Dr. Caligari. 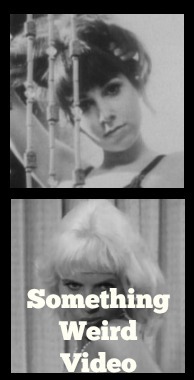 Viva la Expressionsim! 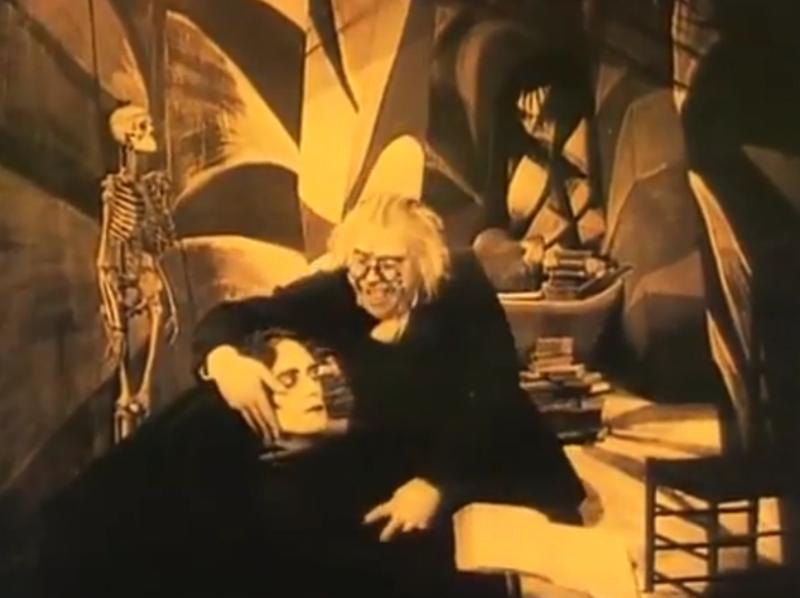 Writers Hans Janowitz and Carl Mayer started the ball rolling with The Cabinet of Dr. Caligari’s concept. The two were excited by this still very new medium called filmmaking. An endeavor that would bring together artists of all kinds; painters, actors, writers and photographers. 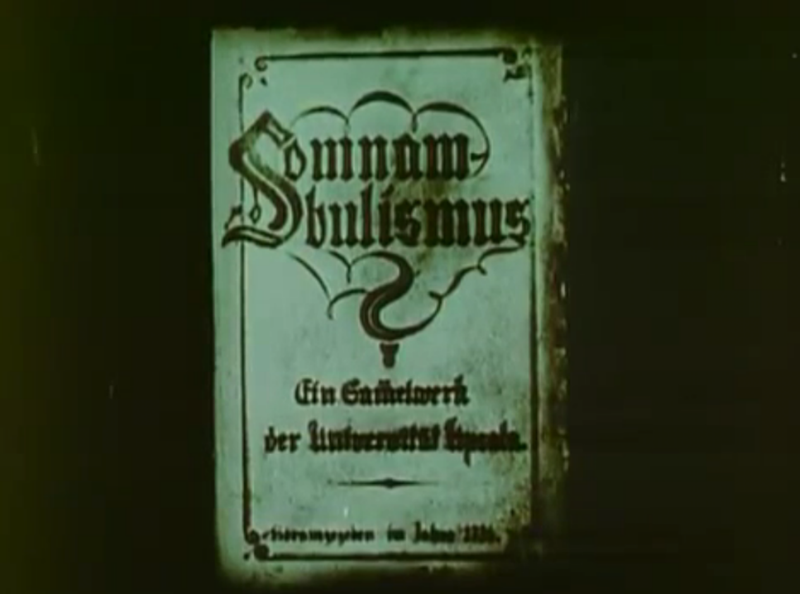 The two men admired the work of Paul Wegener (The Student of Prague, Der Golem) and decided to begin work on a horror tale. The men drew on their experiences as all good writers should. 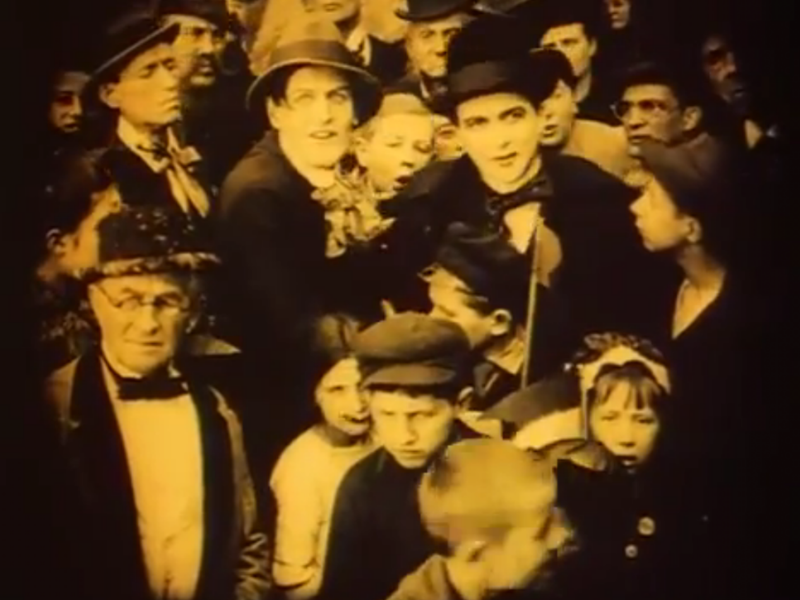 Janowitz and Mayer regularly visited a local fair and were inspired by the sideshows; a key part of The Cabinet of Dr. Caligari’s plot. 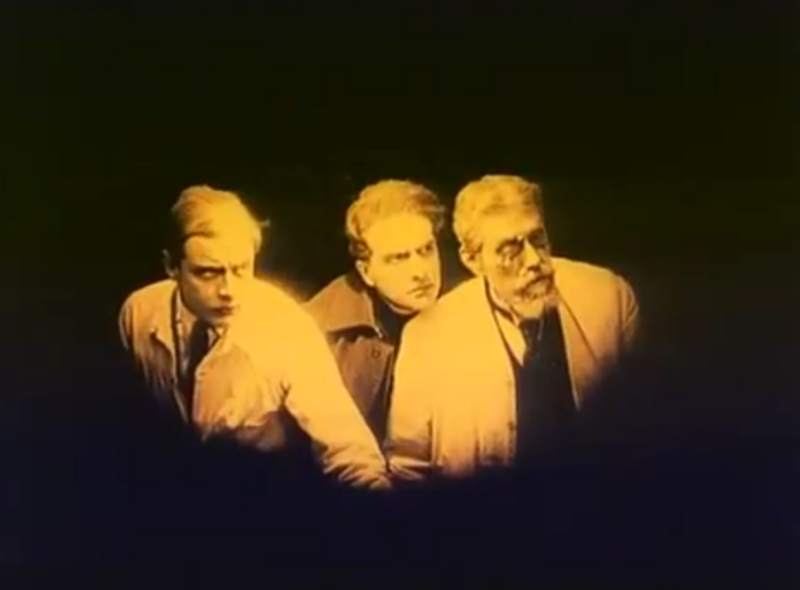 The film’s visuals were put in the very capable hands of designer Hermann Warm and painters Walter Reimann and Walter Röhrig. 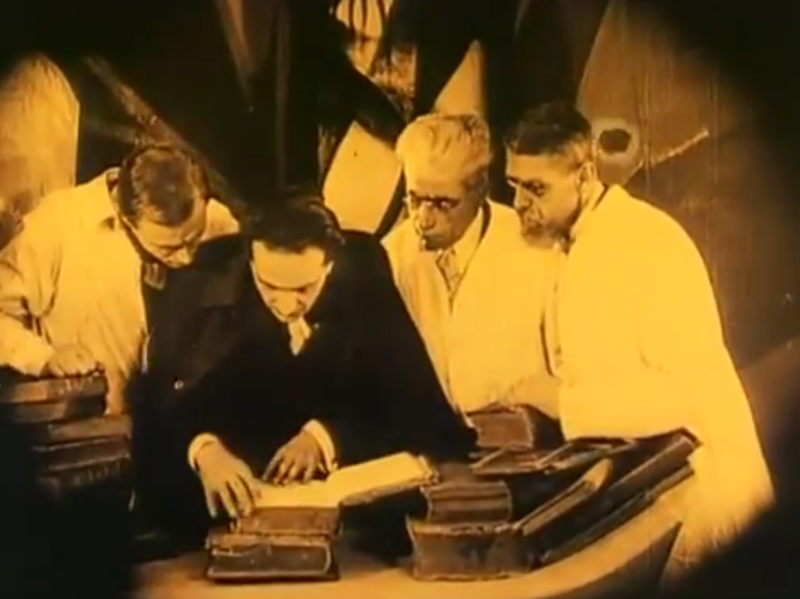 Fritz Lang was the first director approached but was committed to another project. 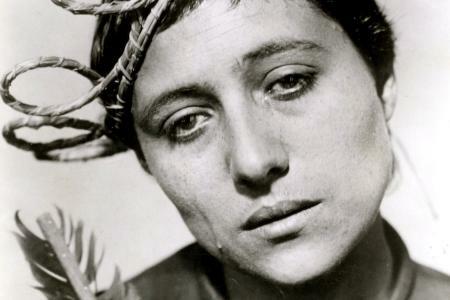 Robert Wiene (whose film The Hands of Orloc is the next film in my queue to watch) was brought in to direct and the rest is history. 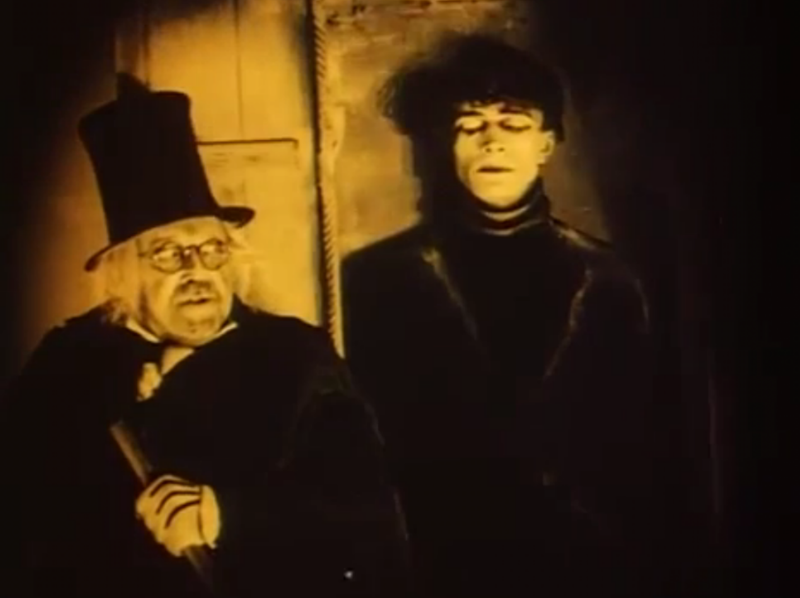 I watched both a black and white and color tinted version of The Cabinet of Dr. Caligari but I went with the pics from the color tinted version. I thought the images were sharper in the black and white version but I am a little bit in love with color tint at the moment so I decided to go with that print. A small German village called Holstenwall is the setting for our strange tale. 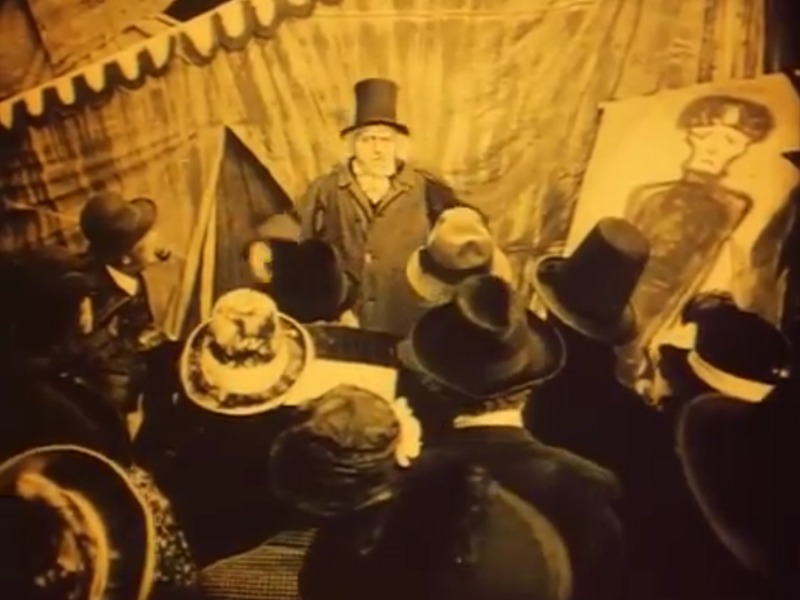 The Cabinet of Dr. Caligari is “A film in six acts written by Carl Mayer and Hans Janowitz.” The Cabinet of Dr. Caligari is not only visual eye candy it is also well written and well-performed. 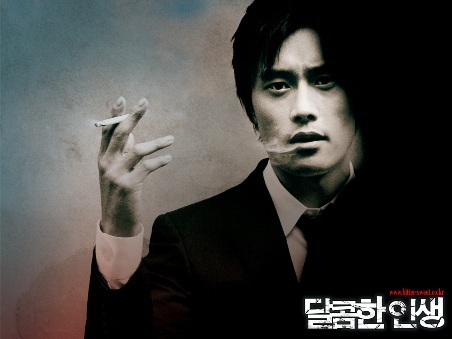 It has a perfect eerie atmosphere and a creepy vibe with an intriguing premise that keeps you mesmerized. 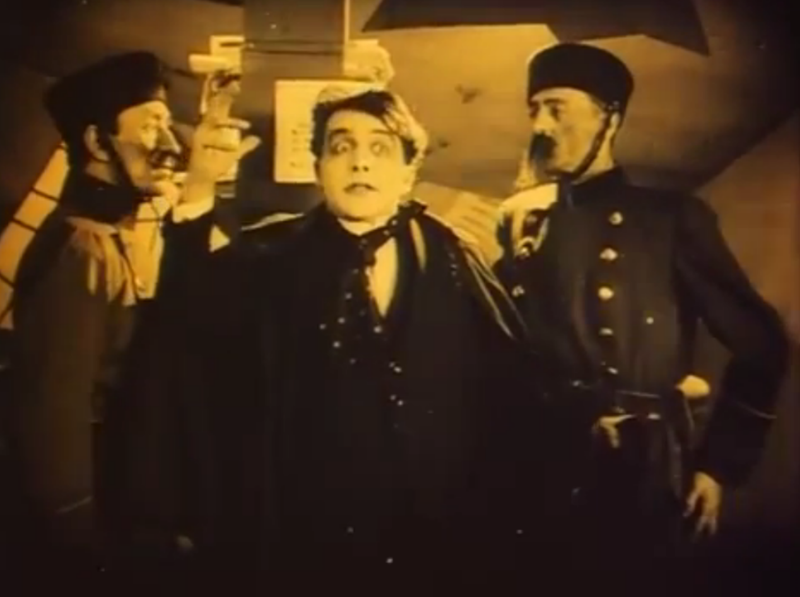 The performances are all excellent but the iconic role of Cesare the Somnambulist played by the immensely talented Conrad Veidt is particularly memorable. Alan cannot resist asking Cesare how long he shall live. 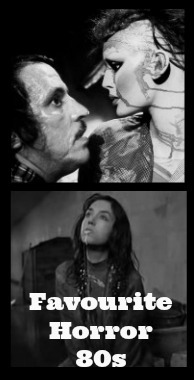 Cesare tells Alan that he will die at dawn. The somnambulist’s prophecy comes true and Alan is murdered at dawn. Francis tells Jane of Alan’s death. Indeed this gentleman has been wrongly accused. 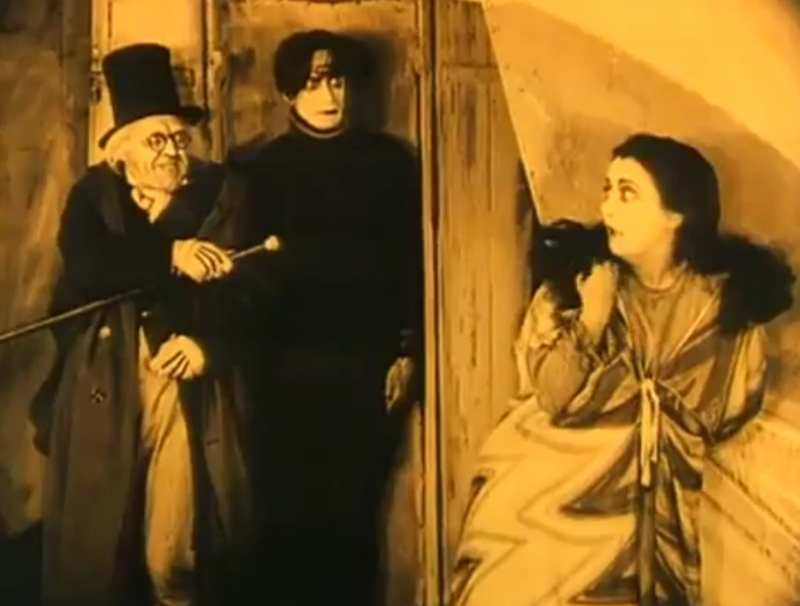 Jane meets Dr. Caligari and Cesare. 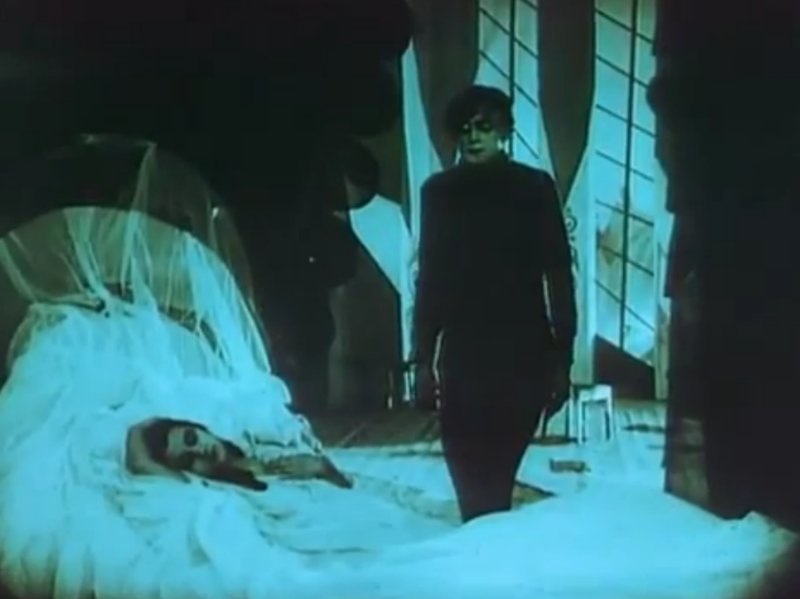 Dr. Caligari orders the sleeping Cesare to murder nosy Jane but her beauty prevents Cesare from ending her life. 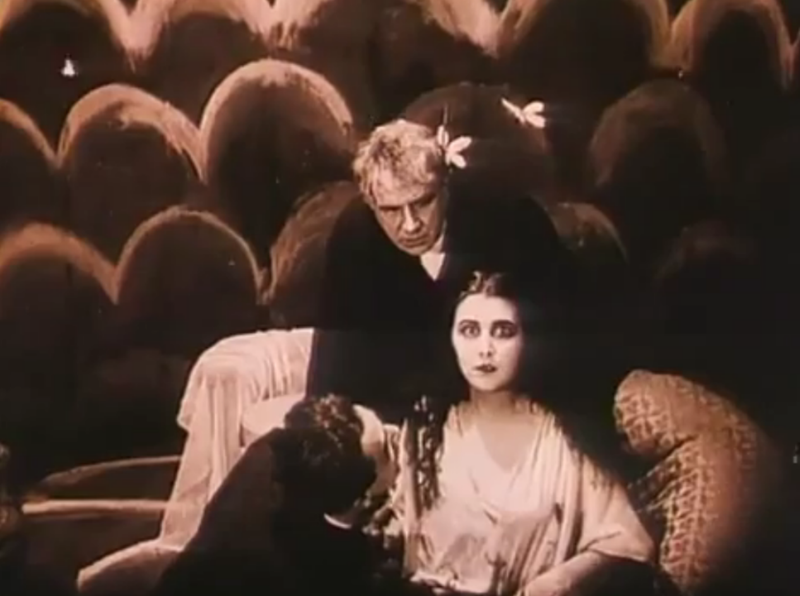 Cesare attempts to kidnap her but gets exhausted from the chase. 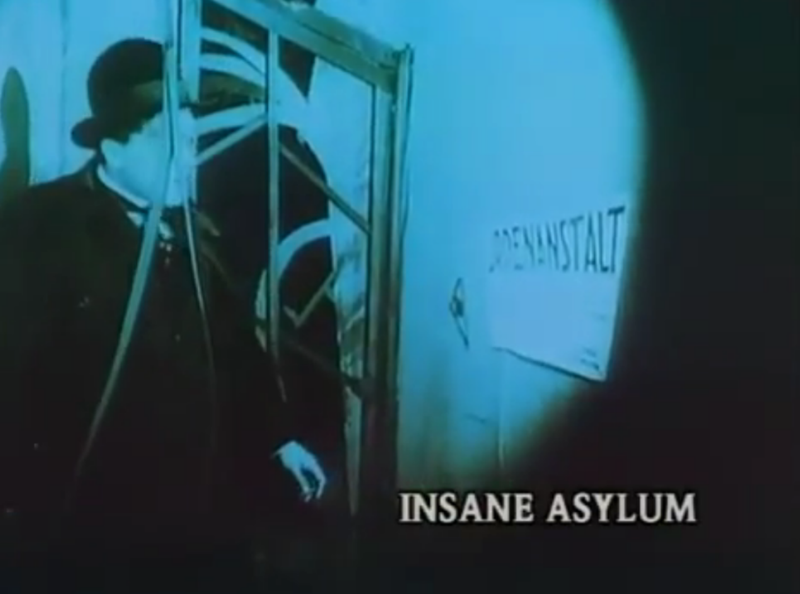 Francis goes to the Insane Asylum and asks the staff if they have a patient called Caligari. They recommend that Francis speak to the director personally. “While the director now placed under observation is sleeping in his villa…” They take the opportunity to snoop through the director/Dr. 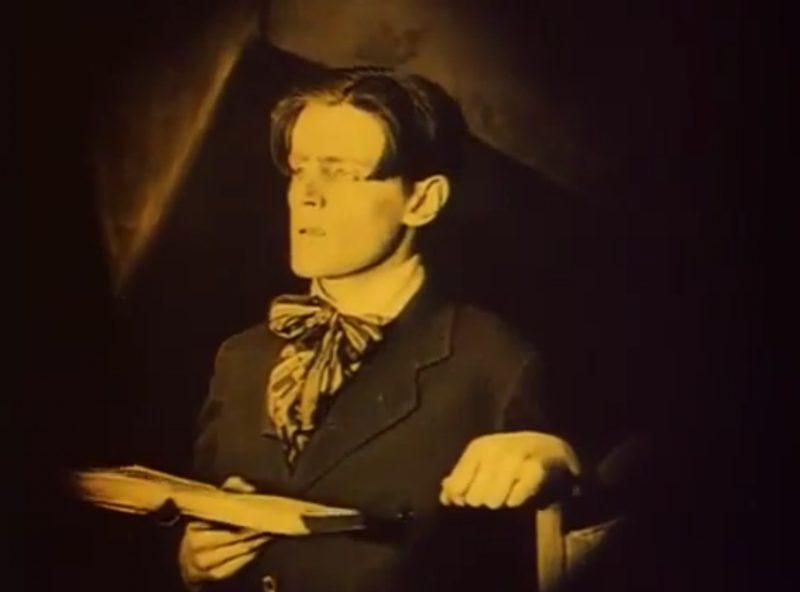 Caligari’s office and discover a book on somnambulists as well as the doctor’s diary. 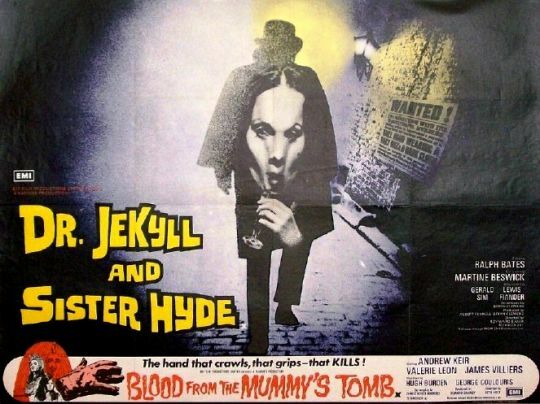 The film ends with a great twist although it was not the ending that writers Hans Janowitz and Carl Mayer originally wrote for the film. 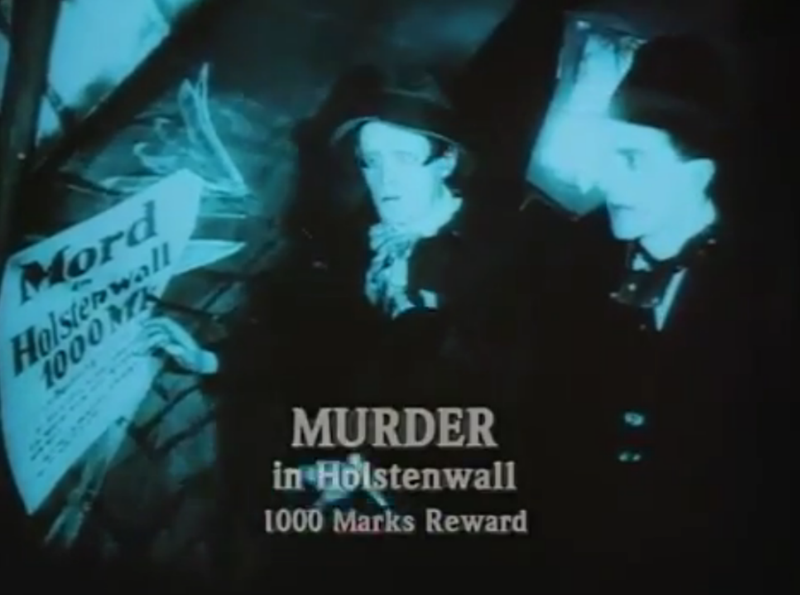 Apparently the producers wanted a less grim ending and suggested the ending that was actually used; which I will not divulge for those who may not have seen it. 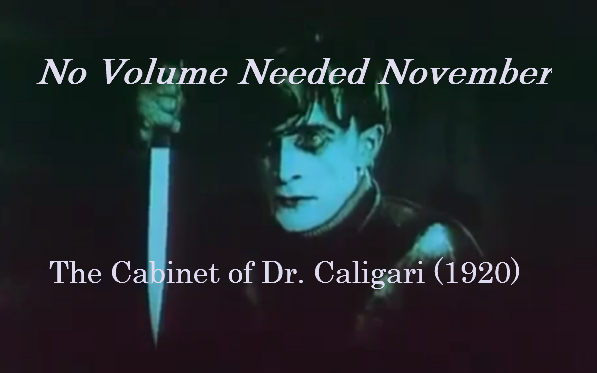 I have seen close to thirty silent horror films at this point in my life and The Cabinet of Dr. Caligari is absolutely one of the best and most unique amoung them. 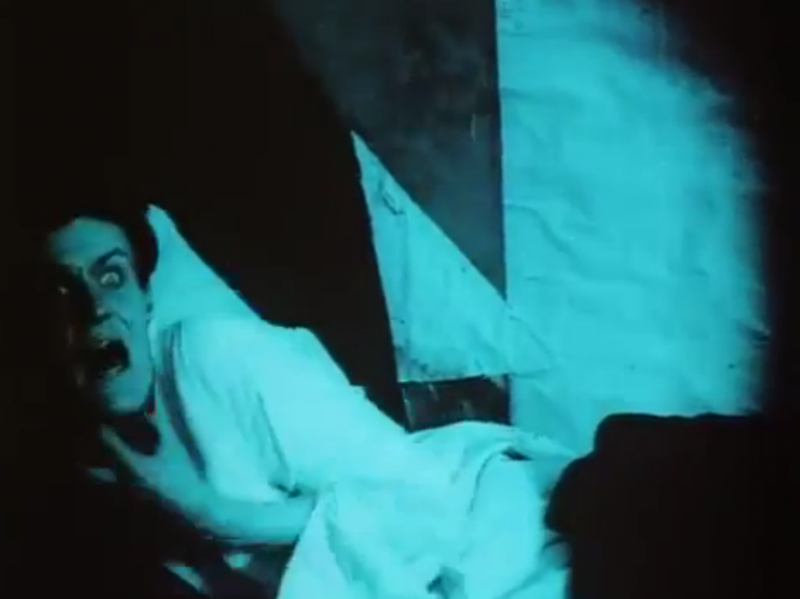 The Cabinet of Dr. Caligari deserves heaps of praise; it is a hypnotic, creepy and visually spectacular masterpiece. Another groovy track from Zenzile! 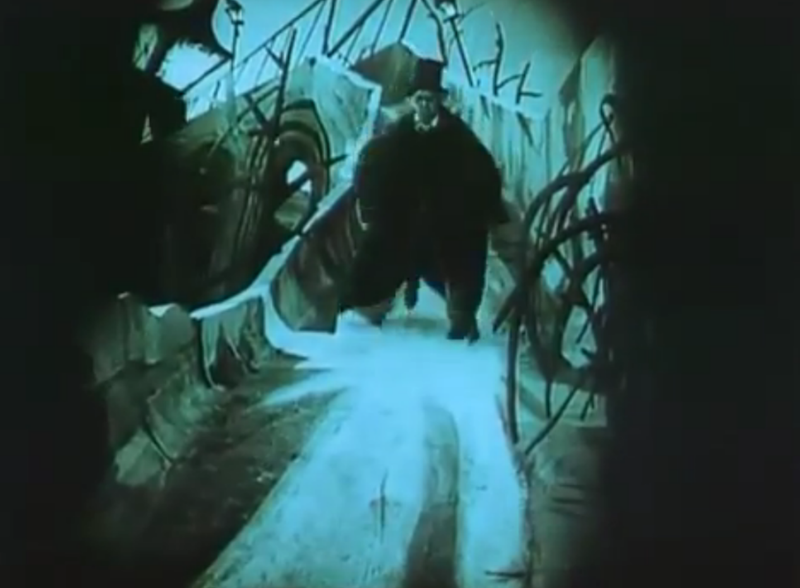 Zenzile’s take on the score for Robert Wiene’s 1920 film The Cabinet of Dr. Caligari with images from Mr. Wiene’s film. Also check out my two nifty tumblr posts dedicated to Cesare here and here. 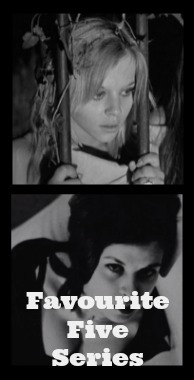 Tomorrow I will have a review for Robert Wiene’s gorgeous film!